North Florida’s spring sports racked up several victories over the weekend and had some losses on their home courts. 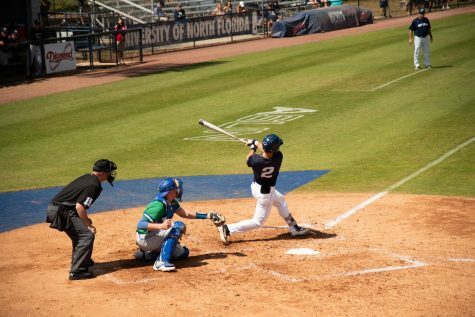 On the first day, North Florida’s (5-7) rally just fell short by one run for a 5-4 defeat to the UConn Huskies at Harmon Stadium. In the second inning, the Huskies converted four runs for an early lead. North Florida saw three runs come in late during the homestretch, but it wasn’t enough to go over the early gap. On an almost perfect day for weather conditions, baseball defeated the Huskies 6-5 the following day. 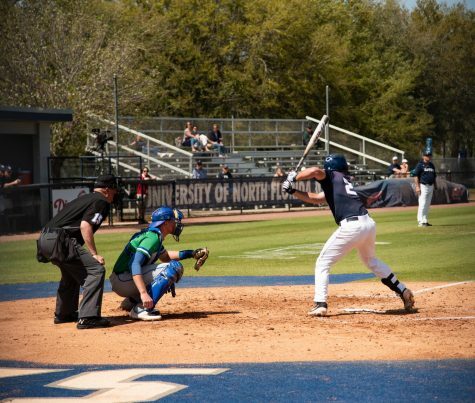 North Florida started the game out on a good note by having nine men come to the plate and scoring five runs off those at-bats in the first inning. 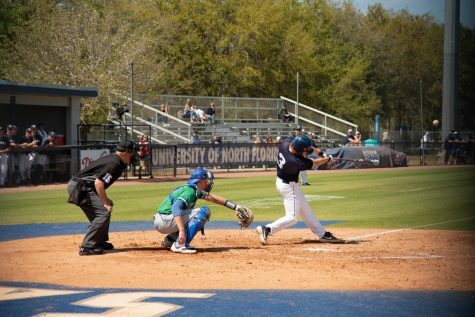 The Ospreys also showed signs of playing aggressive as they went on to steal three bases in the inning. 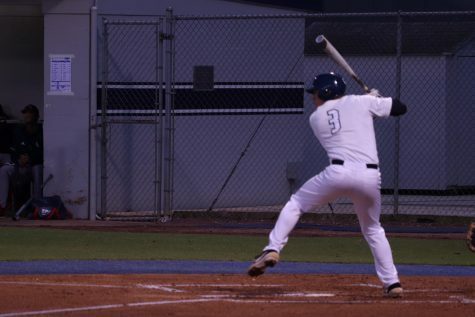 The UConn did not let five runs get in their heads too much as they got three runs in the third inning by some key hitting from their leadoff man John Toppa. 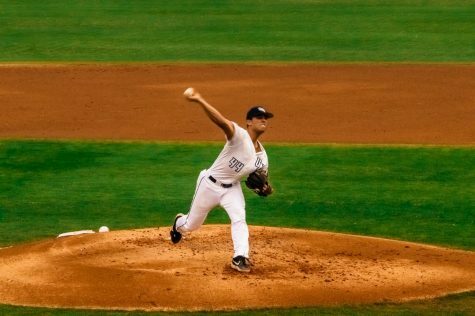 For most of the game both sides had a decent pitching performance. It wasn’t until the eighth inning when once again the Huskies got a clutch two-run home run from Toppa to tie the game at five. 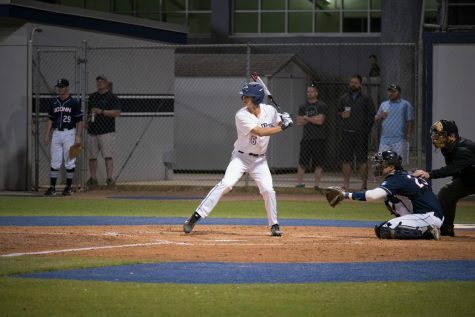 With the ninth inning lurking around the corner, the Ospreys played a mantle game with the Huskies by having patience, drawing a walk, and then stealing a base to put a runner in scoring position. The Ospreys retook the lead in the eighth on an error from the Huskies. For the final meeting, the Ospreys took a 4-2 victory over the Huskies. UConn’s only two runs came in the fourth inning. 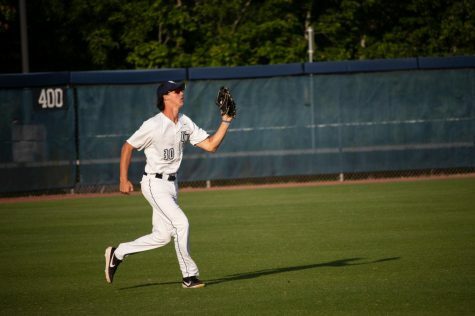 North Florida had three of their own in the sixth inning with a pair off of UConn’s errors. North Florida remains at Harmon Stadium to face crosstown rival Jacksonville University in the Mayor’s Cup on Mar.6. 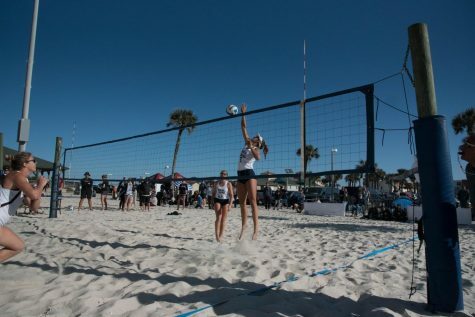 First pitch is at 6:05 p.m.
After a 3-0 start, the beach volleyball team falls to 3-4 on the season after four tough matches at the St. Augustine Pier on March 3 and 4. The team was joined by a beach full of spectators, some uncharacteristically cold and windy weather, and of course, some beach-loving dogs. With both Saturday opponents ranked in the top 20, one might think a small mid-major school wouldn’t be able to handle the pressure, yet North Florida fought until they couldn’t anymore. The Ospreys lost 3-2 to No. 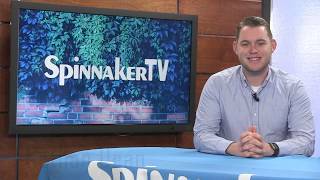 17 FAU and 4-1 to No. 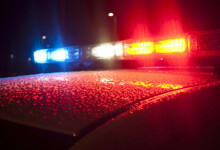 6 LSU. Half of the matches were brought to their full three-game sets as the Ospreys would not go down quietly. Courtney Miller and Carina Hoff won their match against FAU ( 14-21, 21-19, 17-15) on Saturday 2-1. They got the No. 1 position in their first outing as a pair. Taryn Griffey and Chaney Howard followed suit, winning against FAU ( 21-15, 19-21, 16-14) and LSU (16-21, 21-19, 15-11). Those wins put the No. 2 pair at 5-0 on the season together. Sunday was a slightly different story. The Ospreys kept up the fight with all but four matches going to all three games. Half of the games that ended 2-0 were both won by the Ospreys, but unfortunately, those were the only wins they saw on Sunday. The No. 4 duo Carolyn Cain and Blaire Register rose themselves to 4-1 on the season with a two-set win over Texas A&M (21-15, 21-14) and the No. 5 position Madilyn McCarty and Nicole DeBolt followed suit in a nearly identical fashion (21-15, 21-14). Despite a losing weekend, Director of Volleyball and Head Coach Kristen Wright was not disappointed. Two of her players, Taryn Griffey and Chaney Howard were selected to the all-tournament team, both going 2-2. 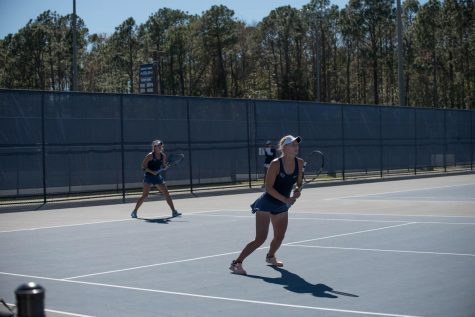 North Florida continues their season in South Carolina on Saturday, March 10 in a rematch with the South Carolina Gamecocks and in a first match with River City rival Jacksonville University. 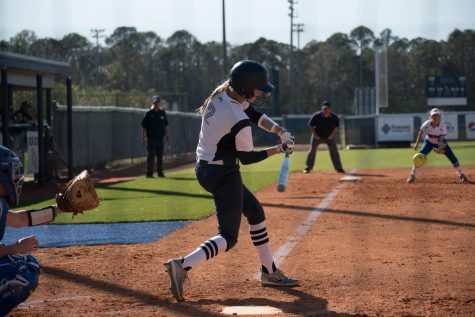 Softball won three out of their four games during the Courtyard Marriott Ospreys Invitational over the weekend. On Friday, the Ospreys spilt the day with a 1-0 victory over Presbyterian and a 1-0 defeat to Middle Tennessee. Senior Amanda Blanchard recorded another shutout with six struck out. 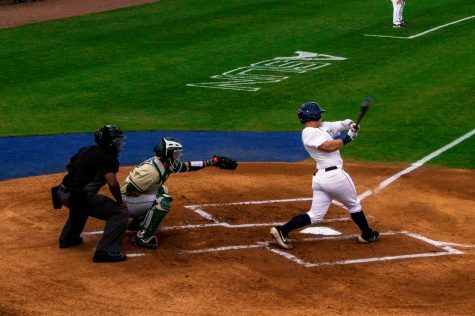 During the Middle Tennessee matchup, numerous runners made it on bases, but couldn’t covert until an extra inning was added to the scoreboard. Middle Tennessee had the only run of the game in the eighth inning. On Saturday, the Ospreys shut out both Campbell and Iowa State with 6-0 and 3-0 victories respectively. In game one, North Florida scored five early runs in the opening frame before they added another one in the following inning. For game two, the Ospreys had all three of their runs in the fourth inning to defeat another Big Ten opponent for the second year in a row. Softball faces Radford on Mar. 7 at 5 p.m. at the UNF Softball Complex. Women’s tennis grabbed two victories over the weekend over Iowa State and ETSU. The squad created a quick advantage and continued to pile on it on Iowa State throughout the match. It was a similar story against ETSU with fast gap that the Ospreys expanded for the weekend winning sweep. 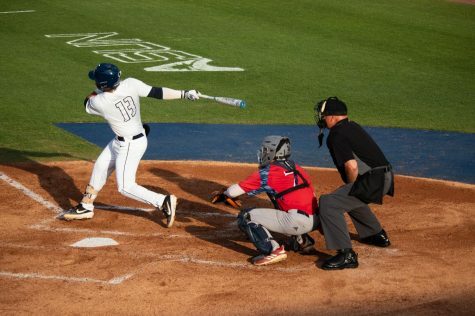 North Florida faces James Madison and Savannah State on Mar.9. Men’s tennis opened ASUN play against FGCU, and earned a 5-2 victory. The Ospreys took an early lead with doubles point and got the edge in tight pair matches.